Launchpad couldn't import bug #35365 from freedesktop.org Bugzilla. When using Ambiance theme the body text in Ooo Writer is not black but gray. This is quite uncomfortable when writing and thus renders the theme in effect unusable. See attached png. * Auto-colored text is illegible on dark background in LibreOffice. * Use "High Contrast" theme, unacceptable to customer. * User has to mnaually change the color from "automatic" to white. * This is affecting a flagship customer. * In Libreoffice Impress the text with the color "automatic" is hard to read if the background color is set to black (example file/screenshot attached). * This patch is a backport form upstream, and has been tested. I do not see any possible regression potential here. 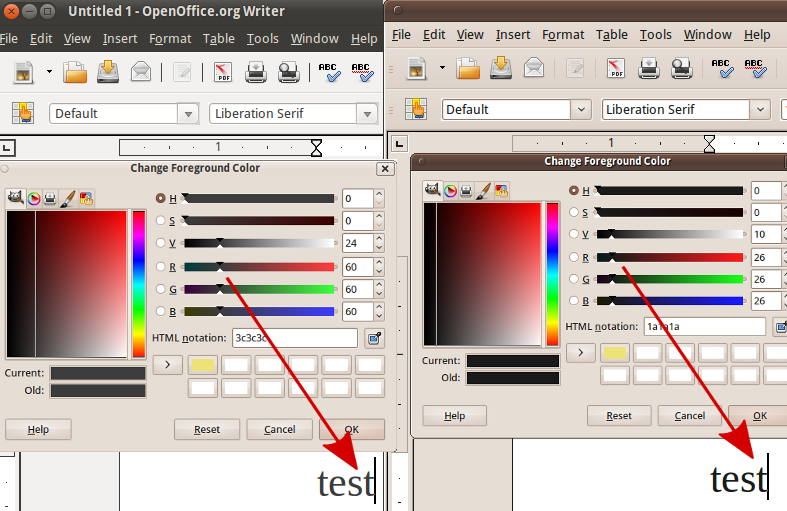 Go to Tools -> Options... -> LibreOffice -> Appearance -> Font Color and change the color from Automatic to Black. Forgot to mention that I'm using light-themes 0.1.6.8~bzr14~ from ppa:murrine-daily/ppa. I won't confirm this bug because I'm not sure if the issue is specifically light-themes, but I have noticed the same thing. Most of the themes give the dark grey text, but some (like the GNOME theme) give black text. I think OpenOffice is inheriting settings from the themes. NOT Reproducible with "LibreOffice 3.3.2RC1 – WIN7 Home Premium (64bit) German UI [OOO330m19 (Build:201 / tag 3.3.2.1)]". I opened sample document, all teext looks white, I modified character color of 1 word in the text from "Auto" to "white" and I did not see any difference to color of "auto" colored characters. The same problem still persists. The difference of text color is evident when using Ambiance theme and e.g. High Contrast theme (see screenshot above). Using 12.04, Unity 3d, all default settings (no ppa's). The fix will be available in LibreOffice 3.7.
libreoffice 4.0.0~beta2 will be uploaded to raring soon. Therefore it make sense to wait for that upload instead of uploading the backported patch. @Bejamin Drung: What about in Precise? Will there be any update soon? We missed the current upload to precise-proposed. The fix should be scheduled for the next upload to precise-proposed. This won't happen before the release of the next point release of precise which is planned for 2013-02-14.
https://gerrit.libreoffice.org/#/c/2156/ for possible 3.6 quantal SRU. Could this be also marked against oneiric, which is being used by one of our stratergic customer. it's not likely that we will do extra oneiric libreoffice uploads at this point... how important is the fix for the customer? I recommend to use the workaround mentioned in the bug description on oneiric. Mildovi'c, your issue sounds unrelated to this bug. Please file a new one instead of changing the status. Thanks. Please do not mess with unrelated bugs. Thanks. @Ritesh: Why going back to "In progress?" -- this is already commited in https://launchpad.net/~libreoffice/+archive/libreoffice-3-5/+sourcepub/3333599/+listing-archive-extra and only needs an SRU. Do you want to help with the redtape for that? Sorry about this. I was under the impression SRU was filled for this, and fix was released. Thank you. Its currently pending feedback on bug #1176923. According to Ritesh bug #1176923 has been tested and verified and the SRU template is complete. Also precise is marked as 'fix committed', however, I dont see any package relating to this in -proposed so I'm not sure what that status is referring to. Moving precise back to in progress and nominated raring to be included in this sru as well. Its fixed for quantal in the ppa, but as is I wont do the redtape dance to SRU 3.6.7 to quantal anymore. When will this be fixed in Precise? Works fine on precise, with libreoffice 3.5.7-0ubuntu5 . When will 3.5.7-0ubuntu5 be pushed to precise-updates?